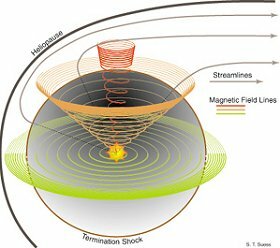 The Interplanetary Magnetic Field: lowest point since 1913? | Watts Up With That? The Interplanetary Magnetic Field: lowest point since 1913? David Archibald writes to tell me that the IMF has hit “rock bottom” and may go lower still. Watching the IMF is a good indicator of the activity of the Sun’s internal magnetic dynamo. Looking at this graph from Archibald, and Lief’s graph below one could conclude that the sun’s inner magnetics are quieter than any time in the last 90+ years. First a bit of a primer to help our readers understand what the IMF is. Steve Suess (NASA/MSFC) prepared this figure, which shows the Sun's spiraling magnetic field from a vantage point ~100 AU from the Sun. The heliospheric current sheet is a three-dimensional form of a Parker spiral that results from the influence of the Sun's rotating magnetic field on the plasma in the interplanetary medium. So far in 2009 there have been individual days as low as 1.8 nanoTeslas, so there may be no physical reason why a monthly average close to 2 is not possible. It seems that the Sun’s “magneticness” drives everything, and in that case the IMF data suggests that solar activity is not even feeling bottom yet. 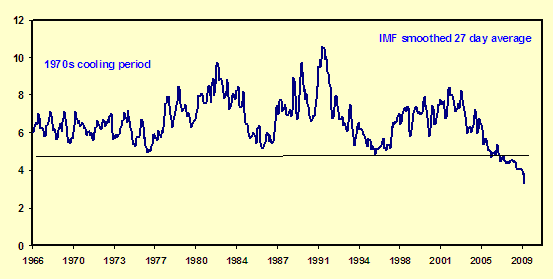 From Leif’s graph, it appears that the last time the IMF got this low was in 1913 during that lull in solar activity. June 3, 2009 in Science, Solar. By Svensmark’s cosmoclimatology theory, a low Interplanetary Magnetic Field will allow more galactic cosmic rays into earth’s atmosphere, causing more ions, causing more low level clouds which reflect more sunlight which will cool the earth, and also cause more precipitation. See: A brief summary of cosmoclimatology Summary of a review article on cosmoclimatology by Henrik Svensmark, Danish National Space Center, published in Astronomy & Geophysics, February 2007. Cosmic ray intensities – and therefore cloudiness – keep changing because the Sun’s magnetic field varies in its ability to repel cosmic rays coming from the Galaxy, before they can reach the Earth. Radioactive carbon-14 and other unusual atoms made in the atmosphere by cosmic rays provide a record of how cosmic-ray intensities have varied in the past. Indeed “Change” is coming! Time to invest in long underwear factories. This is just me eyeballing the chart, admittedly with a single point, but given the large spike around 1992, and then the huge El Nino in 1998, have there been any correlation/lag studies on this index with temperature (other than a simple note on the chart that shows the 70s cooling period)? I have no good scientific reason to explain why the two are correlated, but a 6-ish year lag seems to have enough merit for further study. And if that’s the case, I’m moving from Wisconsin by 2015. Sheesh. I hope there’s nothing to that. I know I have posted this video probably in 4 other threads. I think not everyone is aware of it though. It it speaks directly to this topic. And it does it in very simple terms. I have to ask. Is that good or bad? The Henrik Svensmark, “The Cloud Mystery” should be played on The Science Channel. There is no reason why it should not be. It is fascinating science and belongs out in the public. Does anyone know the procedure for getting a documentary aired on that channel? I will do what I can to help. Unless the AGW camp is right about CO2…It might get a bit chilly for a while. That is quite an apparent change. Thinking of the recent sea ice sensor problems, are we sure that this is real, not sensor created? There has been talk in previous thread of the changes to part of the EM spectrum. Is there a list anywhere of what metrics are available at the moment and how these are changing with the recent minimum? It would be interesting to see where other changes are occurring. A value of 12 Gauss is more correct for 1976, 1986, 1996, but is now only half that, some 7 Gauss. The IMF for the last rotation is always a bit dubious because it is based on incomplete data [18 days out of 27], but there is a more serious problem with the latest OMNI data, that causes the values to be too low by about half a nT. Earlier, data from the ACE spacecraft [spacecraft ID = 71 in the OMNI database] were used, but since late in 2008 they have switched to the Wind spacecraft (ID =51) which has this systematic difference. We shall see how that plays out. The field strength for the past four years [based on ACE] has been: 5.097, 4.493, 4.200, and 2009 so far 4.108 [up until today], so no big drop. Geomagnetic data also suggests a value closer to that of 2008. And as David points out this has come to pass. In fact, solar cycle 23 has turned out very much like solar cycle 13, and SC24 may look like SC14. The transition 23-24 is very much like 13-14, so we are down to values not seen since 1901-1902. This is of great interest for all kinds of reasons. In the http://wattsupwiththat.com/2009/05/30/scientists-issue-unprecedented-forecast-of-next-sunspot-cycle/#comment-139430 thread I draw attention to a very new paper in GRL, that concludes that “A comparison with sunspot and neutron records confirms that ice core 10Be reflects solar Schwabe cycle variations, and continued 10Be variability suggests cyclic solar activity throughout the Maunder and Spörer grand solar activity minima. Recent 10Be values are low; however, they do not indicate unusually high recent solar activity compared to the last 600 years.”. See my comment on this over there. This is so cool. Or should I say – chilling. My appologies for an off topic question but can anyone explain the blip in the ASMR-E Ice extent graph which occurs at this date in several of the past years? How is it going the Ap index? Would this mean an eventual polarity change in the earth’s magnetic field? Well now I have a mental picture of Leif Svalgaard in his office sitting on a swivel chair so he can rotate around while looking down on that crazy Parker spiral; maybe you should get a motor drive for your chair, Leif. This sort of information from Dave, and what Leif constantly feeds us, is both entertaining, and highly informative. We may be comfortable thinking of our sun, as simply the blowtorch putting out “heat”, but it clearly interracts with earth in other ways, and it seems clear, at least to me, that some of these peripheral mechanisms have a lot more influence than we think. I don’t think Svensmark is claiming that the cosmic ray effect is all that controls earth’s climate; but I think we ignore the solar magnetism/cosmic ray/cloud cover mechanism at our peril; it does affect our climate/weather conditions, whther we want to believe that or not. In any case; the real problem is not whether CO2 or clouds or cosmic rays are the major factor in lcimate change; the real problem is this insane belief that the climate change is somehow significant. It isn’t ! So get over it; the climate has always changed; it always will change; we aren’t in control of it, and we won’t ever be in control of it. The best we can hope to achieve, is to understand the factors that do affect the climate, so we can look ahead as we adapt. According to all the AGW catastrophe scenarios; if we implemented the most Draconian CO2 elimination controls possible; such as a total and immediate cessation of the burning of either fossil or any other kinds of carbonaceous fuels, world wide, in 50 years, the global temperature anomaly change would be imperceptible in the noise level of Hansen’s GISStemp. If there are any SETI fans here; you might as well wrap things up; because there isn’t any intelligent life out there in the universe. Intelligence is just Mother Nature’s latest gimmic in the search for survivability; and there’s not a shred of evidence that intelligence works as a survival mechanism; and that is the whole premise on which SETI is based. Well some of us are living in a country, that once was the greatest survival experiment ever conducted on earth; and that country is now deliberately committing national suicide; both economically, and philosophically; and instead of shrinking in horror at the prospect, everyone is out there cheering the destroyers on. No there isn’t any intelligent life anywhere in this universe. Another clue to help in our understanding of some very complex interactions in our solar system. Great stuff. Imagine what we will understand by the year 2100. Not the 2100 in ABC’s version. ~~~~~~~~~~~~~~~~~~~~~~~~~~~~~~~~~~~~~~~~~~~~~~~~~~~~~~~~~~~ I wonder how many people actually believe the extrapolations in that show? Still feeling nauseous almost a day out from viewing such rubbish. The desperation is palpable. One of the hardest things to admit is “I was wrong”. I do not believe we need “Pamela’s Tank” to prevail. A single blade of grass can push up through asphalt by exerting constant pressure and endurance. It may be awhile before we win the day, and sadly, the juggernaut of cap and enslave seems to be unstoppable at this point, but we must persevere against seemingly insurmountable odds. ~~~~~~~~~~~~~~~~~~~~~~~~~~~~~~~~~~~~~~~~~~~~~~~~~~~~~~~~~~~As a youngster, I was always fascinated by electromagnets. I made several dozen in my youth. Unseen forces acting on objects has an appeal that many of you may be able to relate. I intend to keep my youthful curiosity until my final day. If it is chilling, I’m moving also. Hope we know before the housing market spikes again and I need to buy a house in a warmer location. That Svensmark & his colleagues have done a good job. Fantastic show! I was embarrassed by the guy from the Met Office who appeared to interupt Svensmark in full flow before apparently walking off, which professionally speaking was utterly appalling – we had a similar “professional” incident some years ago at a local level & the interuptor – who wasn’t actually a professional engineer, had the Riot Act read out to him, politely, after the meeting. Is there a dvd available anywhere? Sadly, the only way we can see this in the UK is via You Tube, or maybe Channel 4, although the Ministry of Truth would have something to say about such “irresponsible” programme making, & the BBC would NEVER broadcast such shamless & vile atheistic propaganda, clearly from foreign oil sponsored terrorists who must be banned. I tell you it’s like living in Puritan England at times! Well done Just Want Results! “Corrected” data eh? Corrected for what? How is the data for IMF pre 1960s estimated? By sunspot count? There does appear to be a correlation (3 cycles) in the first graph between 1978 and 2009, but from 1966 – 1977 the trend is flat. This is indeed an interesting deep solar minimum, and the debate about the effects of it on Earth will heat up, but one thing is for certain; change is coming. We must be patient, time will reveal the outcome! And what looked like some light lunchtime reading has turned into a heavy meal, thanks to the good Dr. Svalgaard. You’d think this was some kind of science blog already with the recent spate of thought inducing articles. current company excepted, of course. George, I must firmly disagree with you ( first time ever!! ) regarding intelligent life elsewhere. The sad part is, that neither of us has any proof either way. It will be a long time before there is any definitive proof. If there is no intelligent life anywhere else, it seems “an incredible waste of space”. Was it Carl Sagan who said this? One may also argue that there is no intelligent life here,. I think we’re like blind men and women, each felling a different part of the elephant and thinking we understand the whole. The planetary climate is a complex system driven by the sun. There are multiple primary interactions, such as ocean heating and cloud formation. There are multiple secondary interactions, such as wind, rain, ocean currents. Hell , there are probably secondary and quaternary interactions as well. I understand and have modeled missiles, radars, and optical systems in high fidelity (and done it quite well, thank you). I wouldn’t want to attempt climate without several years, a large dedicated staff, and a large enough budget to actually formulate and conduct some tests to verify simulation results. George, just wanted to add that I agree with the point you were making. more serious problem with the latest OMNI data, that causes the values to be too low by about half a nT. Earlier, data from the ACE spacecraft [spacecraft ID = 71 in the OMNI database] were used, but since late in 2008 they have switched to the Wind spacecraft (ID =51) which has this systematic difference. First a technical subtlety: Because of the variations of the field the average magnitude of the scalar field is larger than the average magnitude of the average vector field. ACE reports on the real-time list the average vector field as the ‘total’ field, that is the value of bv = sqrt(bx^2+by^2+bz^2), where bx, by, and bz are the three components of the vector. This is shown as the green curve for the last couple of years. ACE reports to OMNI the true scalar field which was then reported to the world by OMNI and is shown by the red curve, note the constant difference between them (15%). The blue curve is just the green increased by 15% and you can see how well it matches the red curve until the last several rotations [when they started to use the ‘Wind’ data]. I always council against making conclusions beyond the available evidence. Just because there is no evidence of intelligence here doesn’t justify extending the theory to the whole universe. Are these correlations REALLY beautiful, perfect and remarkable? Aren’t these claims questioned by many, including our own Leif? What do the data really tell us? If these correlations are weak, Svensmark’s cosmic ray theory must also be weak, right? I’ve done it all four times, JWR… I know about Svensmark’s theory (I call it theory cause it has been confirmed observationally and experimentally) and each time I’ve seen the movie I’ve been moved to wonder why modern academies give more credit to a model than to reality. Local meteorologists have had problems on forecasting regional precipitation and temperatures because they have not been considering Svensmark’s theory… When they say it will rain, it doesn’t; when they say it won’t rain, it does. When forecasters say temperature will go up to 37 °C, the cloudiness clouds our forecast and the temperature doesn’t go higher than 27 C… And the latter happens in a very hot land. How is the data for IMF pre 1960s estimated? By sunspot count? 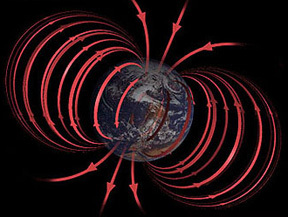 All data need be corrected for various effects that affect them one way or other, like we measure the earth magnetic field with a magnet of known strength, but the effect of the magnetic depends on its length which in turn depend on its temperature, so the reading have to be corrected for that. The cosmic ray count depends on the amount of air above the observer which in turn is given by the barometric pressure, so the count has to be corrected for that, and so on. Thanks to Anthony and David Archibald for alerting us to the sun’s activities, although the most unusual aspect of the unusually low Interplanetary Magnetic Field seems to be from changing instruments. Somehow it feels comforting to imagine that SCs 23-24 might be similar to SCs 12-13. At least we can look to the early 20th century for a while (until the next new data) for ideas about our “future weather/climate”. I am grateful to Leif for the Berggen ea article on the 600-year annual Berylium10 record. I’m interested the findings that “recent Be10 flux in NGRIP is low”, yet there is no unusually high recent solar activity when compared to the rest of the record. Do they mean recent since the 1900s? What do they mean by “low”? Does your IDV index “agree” with their Be10 findings? Does this finding reflect your comments that “solar cycle average B increased by 25% from the 1900s to the 1950s and has been lower since”? Are these correlations REALLY beautiful, perfect and remarkable? If they were, we wouldn’t be debating this issue. In fact, they are not. Beware of people who claim perfect correlation or fit. You only get such things if you really understand the physical cause for something and can calculate from that fundamental understanding what you must observe. I don’t think we have that kind of understanding of the climate, the many claims of the opposite notwithstanding. Does your IDV index “agree” with their Be10 findings? Does this finding reflect your comments that “solar cycle average B increased by 25% from the 1900s to the 1950s and has been lower since”? 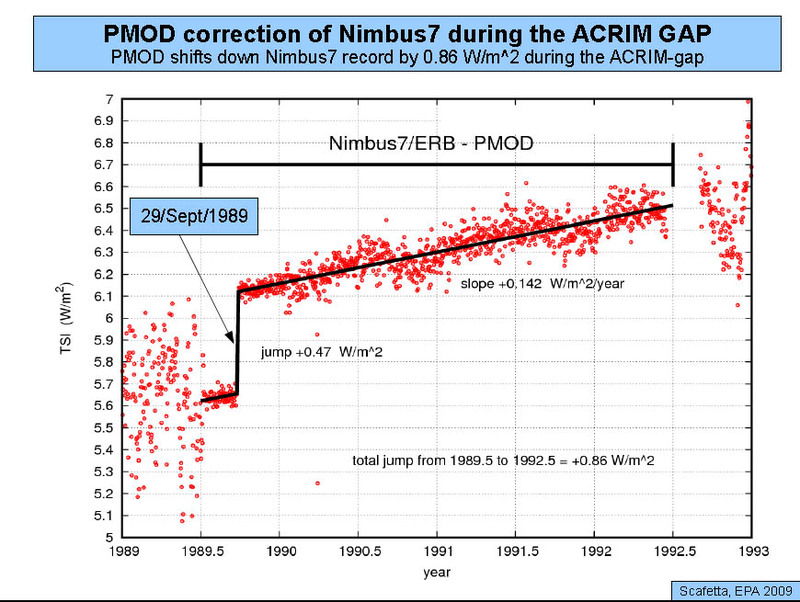 Their data only goes to 1994, and I can’t see what they mean by recent Be10 flux in NGRIP. Since cycle 22 was a very active cycle, 10Be in the last decade of their data would be low. Their findings are very much in agreement with our results. In fact, a nice ‘vindication’. Of course, this is not the final word. The main point of their paper is to point out that different ice cores give different results and that one cannot extrapolate blindly from one core only. We need many more of these, and from the South polar regions as well. I’ve looked for the 11 year solar cycle. I cannot find it. Someone show me the 11 year solar cycle in the temperature record please! I guess that means Svensmark is not correct then! Like all good theories, Svensmark’s theory is evolving. Some of the correlations are very good and others are weaker. There are periods of time in which high energy cosmic rays and low cloud cover have a very high degree of correlation. Some of the arguments against Svensmark have involved correlations of all cosmic rays and all cloud cover – a strawman. Although some of the arguments against Svensmark have been fairly solid. The exact mechanism for the possible connection between cosmic radiation and low cloud cover is not fully developed. Svensmark did, to some extent, empirically test the theory in his lab at the Danish National Space Center (IIRC) in a series of experiments called SKY. Essentially, natural heavy electrons (muons) did seed cloud formation in a type of cloud chamber. The CLOUD experiment involves an interdisciplinary team of scientists from 18 institutes in 9 countries, comprised of atmospheric physicists, solar physicists, and cosmic-ray and particle physicists. The PS provides an artificial source of ‘cosmic rays’ that simulates natural conditions as closely as possible. A beam of particles is sent into a reaction chamber and its effects on aerosol production are recorded and analysed. The initial stage of the experiment uses a prototype detector, but the full CLOUD experiment will include an advanced cloud chamber and a reactor chamber, equipped with a wide range of external instrumentation to monitor and analyse their contents. The temperature and pressure conditions anywhere in the atmosphere can be re-created within the chambers, and all experimental conditions can be controlled and measured, including the ‘cosmic ray’ intensity and the contents of the chambers. And the 11-yr cycle is not in the albedo either. Now, some people claim their is a very small solar signal [like 0.1C], this would be hard to pick out of the noise as the cycle lengths vary a bit. What it shows is that the Sun is not a major driver. Then we could expect (provided Svensmark is right), from nowadays highs in CRs, within 6 years, a very interesting low in temperatures. Anyway it will be blamed by His Highness to “climate change” due again to that “Global Warming” which HE so graciously predicted for the welfare of humanity. You shouldn’t “see” the 11-year sunspot cycle in the temperature data. Does this mean that sunspots modulate the climate? No. But the speed of the cycle could be a proxy for something that does modulate the climate…Like…maybe clouds & albedo. Do you think Svensmark et al have better correlations between solar activity and temperature than the correlation between co2 and temperature, or worse? There has been one view that the Interplanetary Magnetic Field (IMF) has a floor of 4 nanoTeslas below which it cannot go. It would be helpful if David Archibald would reference the souce of his IMF plot. It doesn’t compare particularly well with Leif Svalgaard’s. I agree that you can’t claim proof of causality just based on a close correlation of two functions without a full understanding of the physical mechanisms. But isn’t it just good “science” to consider such correlations to at least form the basis of working hypotheses? I think one of the problems with the whole AGW dilemma is the fact that a perceived deep understanding of the physical mechanisms of CO2’s properties as a greenhouse gas has driven the correlation process; rather than the correlation process driving the search for mechanisms. 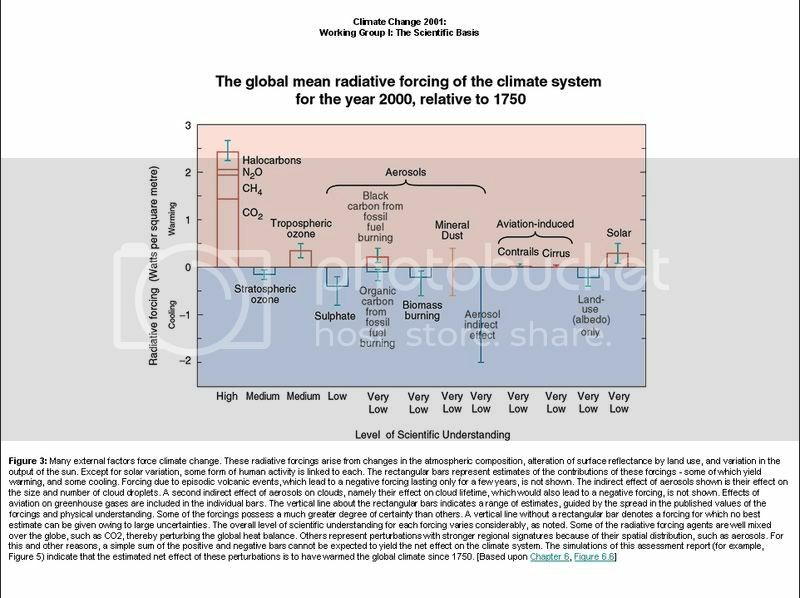 As this chart from IPCC’s 3AR shows, CO2 was considered to be well understood; whereas solar processes and albedo were poorly understood…And low cloud cover wasn’t even mentioned. The funny thing is that if you apply the albedo results of BBSO’s “Earthshine Project” …You get more than enough radiative forcing to explain the warming of the late 20th century. What does it make a cycle longer or smaller than other? The driver of cycle length should be the indirect driver of climate. ??? I guess Svensmark’s correlations are “better” since his correlations are weak while the correlation between CO2 and temperature is virtually nonexistent. In any case, this raises doubts about both theories. P.S. Somebody tell me how to turn italics on and off.
. Then to end it, same but with the slash sign before the “i”. I don’t know. Intuitively I think that when the Sun is more active, the cycle speeds up. I’m not a solar physicist. It has previously been demonstrated that the mean land air temperature of the Northern Hemisphere could adequately be associated with a long-term variation of solar activity as given by the length of the approximately 11-year solar cycle. In this paper it is shown that the right cause-and-effect ordering, in the sense of Granger causality, is present between the smoothed solar cycle length and the cycle mean of Northern Hemisphere land air temperature for the twentieth century, at the 99% significance level. This indicates the existence of a physical mechanism linking solar activity to climate variations. Received 4 July 2000; accepted 4 February 2001; . Citation: Reichel, R., P. Thejll, and K. Lassen (2001), The cause-and-effect relationship of solar cycle length and the Northern Hemisphere air surface temperature, J. Geophys. Res., 106(A8), 15,635–15,641. Global and hemispheric marine temperatures for 1856-1986 have been subjected to harmonic analysis. We investigated a prominent 22-year peak in the Fourier Transform by subtracting from the raw data the inverse transform of the periods longer than 26.2 years (the fifth harmonic). The shorter periods that remain are dominated by the 22-year period the approximate amplitude and phase of which we determined with a 10-year running mean filter. We suggest that this period may be related to the solar magnetic cycle. The low frequency data show a major dip centered around the period 1905-1910. These results should be considered in any analysis of global marine temperature for trends. Received 17 January 1989; accepted 24 February 1989; . Citation: Newell, N. E., R. E. Newell, J. Hsiung, and W. Zhongxiang (1989), Global marine temperature variation and the solar magnetic cycle, Geophys. Res. Lett., 16(4), 311–314. 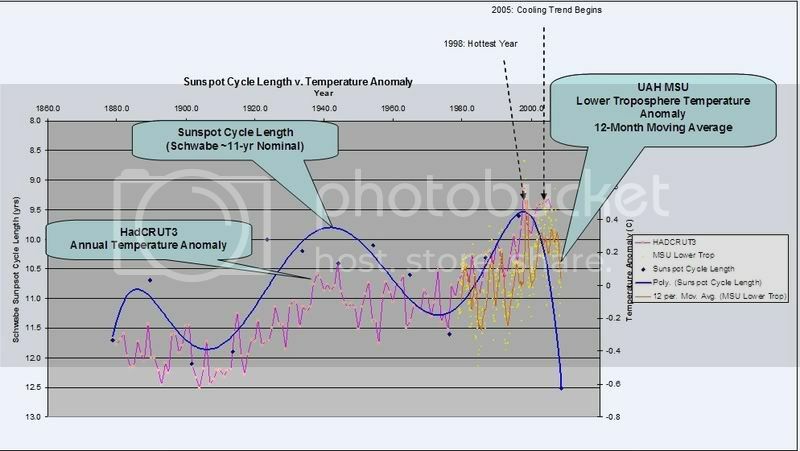 http://www.leif.org/research/Cycle%20Length%20Temperature%20Correlation.pdf the length of cycles since the 1850s [blue symbols – there are two for each cycle: min-to-min and max-to-max, doesn’t make any difference], and the HadCRU temp anomalies [pink symbols – averages over the cycle (again two symbols per cycle – see above). I don’t see any correlation, neither does Excel [see pink symbols in plot in next panel], the R^2 value is 0.03 [meaning no correlation]. If you detrend the temperature curve [taking AGW out 🙂 ], you get the green curve. Again there is hardly any correlation (R^2 = 0.20, not significant), and in any case if the think the R^2 value of 0.2 is a sign on weak [but real] correlation, then it is positive: longer cycles = higher temps. Italicized text…Omit “the letter” bits. For italics put an “i” and “/i” around the italicized text with around the i and /i. With “less than” and “greater than” symbols around the i and /i. The cosmic ray count is still increasing to record levels ( since at least 1964, Oulu). Now that SC 24 has begun, are there good guesses as to when GCR will peak? For the paper: Citation: Reichel, R., P. Thejll, and K. Lassen (2001), The cause-and-effect relationship of solar cycle length and the Northern Hemisphere air surface temperature, J. Geophys. Res., 106(A8), 15,635–15,641. Well there are those who believe in parallel universes also; an infinite number of them. They are quick to add that these other universes are so distant that there is no way we can ever become aware of any of them. I say balderdash ! Anything that we can observe; no matter how strange; by any means that it may make itself known to us, is a part of THE universe. Anything about which we can never know anything by any means now known or to be found in the future; is not a part of science and we have no business discussing it. There is only one universe; that’s what the word means; and it is the one we can “see”. Humans have been discussing life in the universe for centuries. To date we have not so much as one single binary digit of scientific information pertaining to such life originating outside a thin shell no more than about +/- 20 km about mean sea level on planet earth. That is close enough to non-existent for me; sorry, but I don’t waste time on what might be, but is in no way apaprent. And there clearly isn’t intelligent life here on earth, as our Boy wonder Teleprompter Reader in Chief tells us that Iran, that is sitting on more oil than they could possibly burn up in the forseeeable future of humans on this planet; has a need to develop nuclear power plants for energy; while the Country of which he is the de facto leader and protector designate, is prohibited by him, and those who hold his hand towel; from either building any more nuclear power stations itself; or from drilling for the abundant oil and gas sources of energy beneath our own feet. The dinosairs survived for 140 million years just by being big and mean and ugly; while “intelligent” human life has yet to make it to 50,000 years, and likely may not last to the next century. I’m not going to accept that everything imaginable exists; so we should look for it. What do we gain if we discover any sort of life elsewhere. OK go and look if you are curious; just don’t charge me for the tab. different stations show slightly different cosmic ray counts. select 1 day resolution or 1 month for a better view. ‘Record levels’: we are talking of a couple of percent or so over the general trend. It takes the solar wind about a year to fill the heliosphere so the GCR cycle lags behind the solar cycle by about that amount or perhaps a little less, but not much. Chapter 5 – Solar Variability and Climate Cycles which gives a detailed review of Cosmic Rays in section 5.1, pp 208-220. In conclusion, and as Kirkby (2008) rightly notes, “the question of whether, and to what extent, the climate is influenced by solar and cosmic ray variability remains central to our understanding of the anthropogenic contribution to present climate change.” Clearly, carbon dioxide is not the all important dominating factor in earth’s climatic history. Within the context of the Holocene, the only time CO2 moved in concert with air temperature was over the period of earth’s recovery from the global chill of the Little Ice Age (the past century or so), and it does so then only quite imperfectly. The flux of galactic cosmic rays, on the other hand, appears to have influenced ups and downs in both temperature and precipitation over the entire 10-12 thousand years of the Holocene, making it the prime candidate for “prime determinant” of earth’s climatic state. Dave Middleton, Re seeing solar cycles in TSI. reconstructions” and “the same patterns are poorly reproduced by present-day GCMs and are dismissively interpreted as internal variability (noise) of climate. The nonequilibrium thermodynamic models we used suggest that the Sun is influencing climate significantly more than the IPCC report claims” (Scafetta and West, 2008). My guess would be that the solar wind will have a more direct effect on GCR’s and the SSN is more of a proxy. I was wondering though if someone had plotted smoothed SSN, Ap, IMF etc graph that used a 6 to 7 year total for smoothing (as opposed to daily or monthly smoothed numbers). I was wondering this because pulling out a long term trend like that might be more apt to show a corrolation (or not) to long term climate change since there are lot’s of little things that show good corrolations but never quite perfect. One of these has been length of sunspot cycle, and cycle length changes should show up well if the smoothing was done for a longer time. I chose 6 to 7 years just because of the question of the possible corrolation of the ’91 major dip and the ’98 super El Nino. The correlations are not perfect, but are definitely there, and some are striking. The thing they are lacking is causation since we don’t know the mechanism, though many explanations seem plausible. Some are a little difficult to test as you might imagine. I don’t personally have a big issue with correlations that seem obvious though we don’t know the mechanism. If the variation in one relates to variation in another, statistically, it takes variation away from what is so often blamed on CO2. CO2 only has a weak correlation to temperature IF you ignore all of the other factors like ocean oscillations, planetary movements, etc. Leif will probably disagree since many solar changes are too small to explain the temperature differences. I think it’s quite possible that small changes in some solar factors produce larger changes in primarily albedo, by whatever mechanism, that can account for the temperature differences that TSI alone cannot. I can accept that we don’t know the mechanisms behind everything, we hardly ever do in the overall scheme of things. It is, however, easy to reject CO2 as a major cause, as has been demonstrated so many times. The Ap Index and the aa Index are following the IMF down. Oulu looks like it will reach at least 7030 versus my prediction of a peak of 6900. The heliospheric current sheet is continuing to flatten, and taking its time about it. It will be interesting to see what the bottom of solar activity looks like – a V turn or an extended base? As far as the solar-climate connection goes, the solar cycle length/average temperature over the following cycle plots (Friis-Christensen and Lassen theory) mean that significant cooling is certain. For the DVD of “The Cloud Mystery” look up the web site under the same name. Dr David Archibald…………what was that prediction for global temp by middle of the year? Someone (not me) pointed out that the prediction would be a spectacular failure……..I guess that someone will be much closer to the truth than the Dr! <i> turns italics on and </i> turns italics off. Piers Corbyn uses the sun in making his forecast, both short range and long range. He does not use the sun exclusively. But he has said the sun is the driver of climate. It his hard to ignore his record. Is it 100%? Of course it isn’t. But it is higher than any other. It may be sinking in that the sun must be looked at more closely. Some of the money going in to the study of co2’s effect on climate must start being diverted into the study of the sun. Another portion must go to studying ocean currents. And still more must go in to other areas that are obviously related to understanding weather and climate. Apparently both Piers Corbyn, amd Anthony Watts(et al)say the moon is involved too. As Dave Middleton (12:04:38) : has said “Like all good theories, Svensmark’s theory is evolving.” The relationships are beautiful and fascinating. To see a relationship verified by data is beautiful. It is what all scientists work for. To me that’s why the Svensmark video is so ‘remarkable’; Svensmark’s theory has elegance. A new discovery in science is beautiful, isn’t it? I think it is. Can any one really say there is nothing real to it? The aerosols are there. Also, I have not heard either Svensmark or Corbyn claim anything about the 11 year cycle. A relation between cosmic rays and aerosols does exist. To label that relation ‘strong’ or ‘weak’ at this point is premature. We can however conclude the realtion is real. It exists. At least temperature increases with CO2 whereas Temperature is not related to TSI. I realise that plotting 2 increasing variables against each other will show correlation. But at least there is correlation and not randomness! Leif (14:04:06)– I deliberately wrote that GCR were at “record levels” knowing full well that they were currently only marginally higher than at earlier peaks, since alarmists (not me) wallow in hyperbole. Thanks for the info, and for your many comments. But, but, but George. With so many stars in the universe, there must be intelligent life somewhere. But at least it’s progressing according to sound scientific principles. I suspect that Svensmark’s theory will prove to be valid, but that it won’t be the single factor driving climate. I’m also inclined to think that climate is driven by a number of irregular cyclical factors, and that it may be possible to eventually predict what the approximate effect may be at different points of convergence, but that it will never be possible to place those points on a timeline. Svensmark’s work may have merit but Corbyn’s has none: because he will not tell us what it is. He may be successful commercially but we have no idea how he makes his forecast. He claims it is the sun: for all we know it might be a dart board. If he genuinely does have knowledge about the sun we do not he will not be the first to conceal technical data to his commercial advantage: known in IP law as Secret Process. On the other hand many an ?honest? quacksalver has sold the True Triacle of the Ancients. The very best is aged in casks beneath a pyramid I understand. Or not as the case might or might not be. The shorter periods that remain are dominated by the 22-year period the …. We suggest that this period may be related to the solar magnetic cycle. The low frequency data show a major dip centered around the period 1905-1910. These results should be considered in any analysis of global marine temperature for trends. Show me the 22 year cycle in temperature please. Note that it has to be 2*the solar cycle exactly. How does the 11 year cycle generate a 22 year cycle? If the flux was going from high negative to high positive on an 11 year cycle then perhaps one could imagine a 22 year low flux to high flux magnitude cycle. 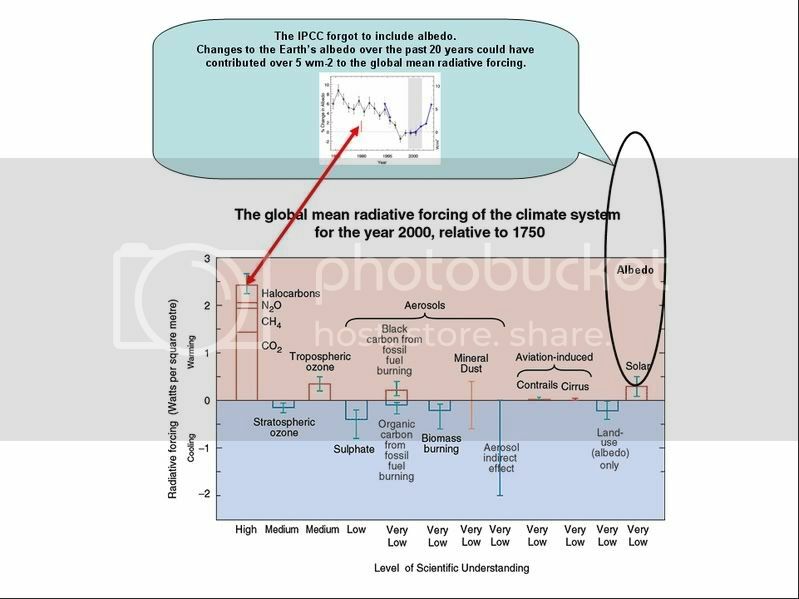 You have all in the opposite way… CO2 increases with increases in oceans and subsurface materials of ground temperatures. Do you know the dry sand and dry clay absorb CO2 during nighttime and release it when get warmer? Clever! had to cheat and look at page source to see how you did that. The problem is that the correlation is not good, as I showed. Thanks for pointing out that the floor is broken. See above how there is a significant problem with the OMNI data. (Friis-Christensen and Lassen theory) mean that significant cooling is certain. Except that the F-L theory is junk as has been shown repeatedly, even on this very thread. Sorry. Meant to suggest a specific thread, not immediate discussion. Will try to do better. George E. Smith (09:00:19) : Well some of us are living in a country, that once was the greatest survival experiment ever conducted on earth; and that country is now deliberately committing national suicide; both economically, and philosophically; and instead of shrinking in horror at the prospect, everyone is out there cheering the destroyers on. Well, you can be upset about it our you can buy stock in the cheer leading costume sales company and use the money to take care of you and yours… I came from a poor background. I was stunned when a “rich kid” in college said this, but in retrospect, I think it has some value. He said “Don’t complain about the stupid, make money off of them.” It offended my dirt poor Joe Sixpack farm town egalitarian ethos. While he was arrogant about it; and I’m reluctant about it; it is sound advice for this kind of thing. So you can’t change Obama and you can’t stop Boxer, and no body can ever give Pelosi a clue (and if she had one she wouldn’t know what to do with it)… at least you can make some money off of them. They hand China a free pass? They give India a free pass? They pump $1B a year of subsidy (sorry, “Foreign Aid”) into Egypt and Israel each year? Own China, India, etc. stocks. TEVA is an Israeli drug company. CEL is their cell phones. TKC is the Turkish one. VOD Vodaphone has a big presence in the 3rd world. So you bet on the ones who don’t have the stupids tax. DISCLOSURE: I own CEL and I’m waiting for an entry in TEVA. I’m also looking at the Islamic country funds and stocks, but haven’t reached any conclusions yet. The 22 year cycle is just two of the 11 year cycles. The polarity reverses between 11 year cycles. That’s one of the ways you can tell a cycle 24 spot from a cycle 23 spot; they have opposite magnetic polarities. Well if you say so Gilbert. Now quickly; give me a list of the ten most important things; about which we have not one bit of evidence peer reviewed or not, but which simply must exist, because the Universe is so vast. I can give you a list of things about which we have oodles, and oodles of information, similar to the information we have on intelligence; yet none of which exist anywhere in the universe; not a single one. How about: points, lines, surfaces, circles, ellipses, spheres, triangles, squares, parabolas, hyperbolas. There’s a start. We made them all up in our heads; they are a total fiction; just like intelligent life out there in the universe. I am now confused but perhaps Leif could explain? Sorry. I’m still learning the lingo and my “BS off” didn’t come thru with the comment. 1913… so that would be near the end of the Damon Minimum? Thanks for posting that link to the CLOUD experiment progress report. It was great to see the main chamber in construction. This is what I call real climate science. I was shocked recently to read of a paper claiming to have disproved Svensmark’s theory using computer modeling. The publication of such computer model based work while an actual physical experiment is in construction raises difficult questions. I find it telling that the foreword in Svensmark and Calder’s book The Chilling Stars was written by Eugene Parker. I seem to recall the consensus opposition to Parker’s solar wind theory was dealt a blow by physical expeimentation. In what way, would the lack of an 11 year cycle prove that “Svensmark is incorrect. ” ? How about if there was a 22 year cycle; since the sunspot polarity reverses each 11 years, but the earth’s field doesn’t, then the combined field might show an assymmetry which could show up in the cosmic ray distribution on earth, by steering cosmic rays towards the magnetic poles which are regions of low moisture content, and away from equatorial regions which are regions of high cloud forming moisture content. I’m not saying there is a perceivable 22 year temperature record; well I don’t believe there is a credible temperature record going back before the Argo buoys were put out in the ocean. But back to Svensmark. In my view, the strongest evidence to support his idea; other than the obvious that cosmic rays do enhance cloud nucleation; is the long term record of sunspot cycle peak counts. 80, 115, 150, 190, 110, 155, 160, > 125 at the recent cycle #23 for which I have no number. The avbove numbers were pinched fair and square from page 178 from Dr Willie Soon’s book; The Maunder Minimum and the Variable Sun-Earth Connection. They may suffer from my errors in interpolating off the not very accurate style graph. So that run of peaks from cycle 17 to cycle 23, from 1937ish to 200Xish with counts of 115, 150, 190, 110, 155, 160, >125 is a seven cycle long record of the highest average peak numbers in the entire recorded history of sunspots. The 190 peak (#19) of the IGY in 1957/8 is the highest sun spot peak of all recorded history, and before #18, no previous peak ever exceeded 150, and only eight previous peaks ever exceeded 100. So we had seven peaks in a row above 100, with no previous period having more than 4 in a row. So from 1937 to the peak of cycle 23 (wherever that ended up) we have had a remarkable, and unprecedented, never before seen period of abnormally high AVERAGE sunspot numbers, and solar activity. Sorry for all the alarmist superlatives lingo there. But now does somebody want to tell me that the sunspot cycles don’t impact the earth’s climate. Seven cycles of the highest average sunspot counts of all time, covering a period during which we had admittedly a period of warmer mean global temperatures. No it is NOT a proof; but it IS the pattern you could not see. 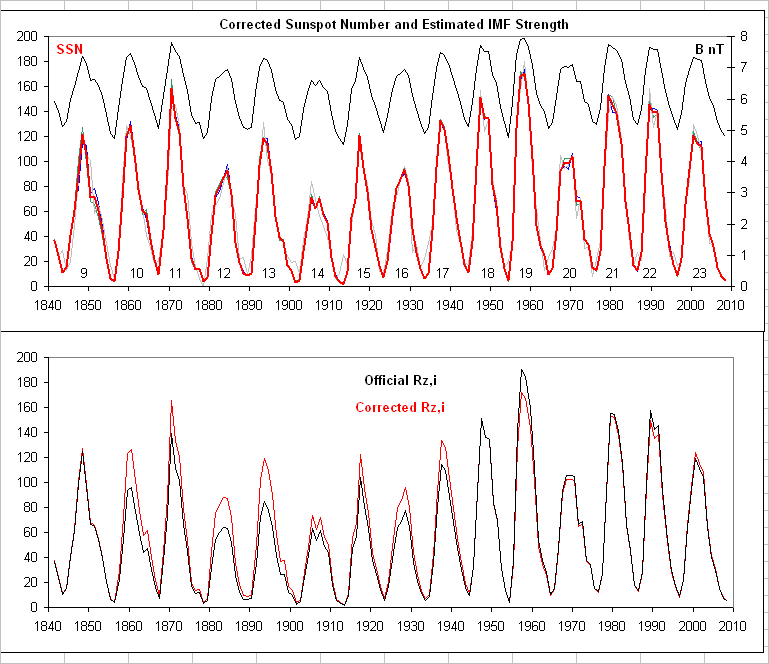 I’ll let those who have access to some phony global temperature proxies dating back to 1600 do the comparison of those temperatures to the concurrent sunspot counts; noting only that from1645 to 1715 during the Maunder minimum it was bloody cold (scientifically speaking) and the sunspot peak counts were in the low zeros for 70 years. Maybe just a coincidence; not a proof; but you were looking for a pattern; right ? Thank you for the link to the Reichel paper. Well, Dr. Svalgaard…I’m just going to have to figure out a way to organize the data in such a way to convince you that my correlation is reasonable. And at ~$3.50/mcf those gas shale plays will be more quiet than the Maunder Minimum! The IMF must cause some eddy currents in the earth’s atmosphere. There must be some electromagnetic induction heating of the earth’s atmosphere due to the earth passing through the IMF and the IMF passing through the earth. If in times of high solar activity power grids can be brought down, there has to be a significant affect due the sun’s activity. Less solar activity, less electromagnetic induction heating of the atmosphere. Therefore lower temperatures. Why is this ignored? I don’t know who originated the graphic of the Parker Spiral, but you can see the same here. If you ever want to get an idea of how little we really know about the universe read a little of Alfven or Paratt, or consider that 90% of the universe is supposed to be “dark matter”. Preemptive disclaimer: yes, I know there are some real crackpots attracted by the “Plasma Universe”, but that is always true when the envelope is being pushed and no reason the reject the idea in toto. You are so right. All sensors & electronics have noise. All observed measurements have a range of uncertainty. The atmosphere of Earth is what separates me from taking diffraction-limited images, whether scintillation or refraction, it has to be corrected. Even correction itself is a source of noise, there being only so much you can do, and it ends up being subject to the law of diminishing returns. One of the things I got from Svensmark is that the amount of cosmic rays in any given sector of the galaxy is not a constant. The Solar System could in fact have entered such sectors exceptionally high in GCR’s as in a Spiral Arm. The arms themselves vary. Precession of the orbit around the galaxy could also make repeated entries into the same arms pass through differing densities. The resulting swarms of GCR’s would lead to differing depths and lengths of Ice Ages given Svensmark is correct. That the present orbit is along the galactic plane does not mean that further in the past it was not (as in highly inclined) or will again incline due to perturbations. Such as very young understanding of our galactic surroundings and so much more to be discovered. Leif’s plot of IMF shows no reversal. The sun field does reverse at 22 year cycle […] I am now confused but perhaps Leif could explain? The IMF must cause some eddy currents in the earth’s atmosphere. […] Why is this ignored? Because that is not the way it works. The eddy currents are formed high above the Earth, some 40,000 miles ‘up’ or out, where the Earth’s magnetic field begins to stop the solar winf from getting any closer. I did [see the paper referred to above], with some basic theoretical ideas going back to E. Parker and Mike Schulz. I don’t think organizing the data any other [honest] way will show a better correlation than is in the data to begin with and http://www.leif.org/research/Cycle%20Length%20Temperature%20Correlation.pdf shows that there isn’t any. OK, here is a sales pitch for deterministic chaos. In contrast to colloquial chaos, which from definition is related to randomness and cannot be studied further, deterministic chaos happens when the underlying equations controlling a physical system are known, but they are so many and disparate that it is not possible to have one to one solutions, as we are used when solving dynamical problems. It means that the push and pull from different known dynamics is such that the outcome of the process under study cannot be deduced with the usual means of correlations or not. Let me give an example: Take a long flat beach. The waves come with a certain predictable frequency and height. After some observation the frequency and height are tabulated. Suddenly the pattern is broken by the wake of a large oil transport. With some calculational effort and knowledge of coordinates and velocity etc of the tanker, the change in the pattern could be predicted. If a second tanker goes by at the same time, predictability fades. In the weather/climate observations there are many such inputs: PDO, ENSO, all the ocean currents, all the air currents transferring enormous amounts of heat/humidity around and out and on top of this small inputs from sun behavior, both energy and electromagnetic, not to forget volcanics. Svenmark’s cosmic rays suggestion is one input in this soup. To expect a one to one correlation with sunspot cycles is hopeless, imo. Only using the tools of chaotic theory one might come into some order in this, again imo, and it will not be the order people expect. Now I do not know about temperatures and sun cycles, but I do know about tree rings and sun cycles. That is where sun cycles were discovered, in the change of thickness of tree rings. Change of thickness means climate change, the whole caboodle, from rains to available CO2 to temperature to what not. But an overall correlation exists. Even a single, simple equation can exhibit deterministic chaos – example: The logistic equation. …but my intention in commenting is not to send people down fruitless paths. I am a SATCOMM operator for the Marine Corps. I probably know the answer, but would like a second opinion. Would less sun spots or IMF mean that as a Ground Mobile Forces operator see higher gains with less out put power(amplification) in ranges of SHF an EHF frequencies? I would think that would be yes, because usually any clearing of interference/noise is always beneficial for the resource constrained DSCS III Satellites, but not to worry DSCS III is being phased out as of last spring/summer with much more heftier WGF(Wide Gap-band Filler) Sat’s state of the art stuff, which are now able to Tx & Rx in the Ka and Ku bands, but the cool thing is that let’s say I Tx in X-band to you but you need Ka the (WGF) will automatically make the conversion so that both Ground Sat Terminals can communicate in lag free Full Duplex. I think that is the best and darn “awesomest” investment the military has made thus far. Looking forward to your answer to confirm my knowledge on this subject. The avbove numbers were pinched fair and square from page 178 from Dr Willie Soon’s book; The Maunder Minimum and the Variable Sun-Earth Connection. Rather ironic page number, but I have also noticed the overall trend in sunspot numbers and climate as you have. The overall trend is what is important not trying to match individual sunspot records with climate. Can anyone tell me why it well into the Month of June here in okinawa, Japan and Since the Beginning of May we have had the equivalent to 6 full 24 hour periods of cloud/rain/cool free days = Awesome sunshine, a bit unusual for this time of year. I always look forward to summer time Temps otherwise I would never leave house I would rather it be 85Deg F or more outside which makes going to beach and snorkeling around the beautiful coral all the more enjoyable. Otherwise it would be to cool for comfort I am Tropical person I hate,HATE cold weather. 80-98 deg is quite comfortable to me, I could always take more clothes off 😉 , but I could never put on enough layers of clothing to get warm. The IMF changes sign every week or two [and sometimes from minute to minute] as the heliospheric fields sweeps over the Earth. My plot shows the magnitude of the IMF. So there is NO 22 year magnitude cycle. Just the usual 11 year variation in absolute field strength the sign of which changes at the whim of the solar wind. “” anna v (22:48:17) : …predictability fades. I think some are expecting perfect correlation. I think only God can understand the complexities and see perfect correlation. The rest of us get only glimpses. Our human limitations not only keep us from grasping all these complexities but also trouble us in accepting new ideas that can be part of the explanation of these complexities, like Henrik Svensmark work. I just watched the Svensmark videos. Truly excellent. You can’t but be impressed by his calm, methodical and patient work. How different to some other scientists we could mention! Is his theory right? I don’t know, but I would say it’s far more likely to be right than AGW. As I think someone else mentioned, it would be great if Svensmark could be persuaded to write a piece for WUWT. I would particularly like to know what is the current state of his research. Also, it strikes me that the current state of the sun may provide a critical test of his theories. One could not expect temperatures to exactly follow solar activity unless one expected the response in the change of temperatures to be immediate and absolute to that change in solar activity. It takes a long time to warm the oceans up and there are many other factors at work such as currents and changes in atmospheric composition. The trend in solar activity since the Dalton minimum has been up and the trend in temperatures has been up. This doesn’t mean that the two have to be connected. A mechanism hasn’t been identified and I no more believe in an unidentified mechanism then I do in the tooth fairy but I still have to explain how the money got under my pillow. If the current predictions for solar cycle 25 are accurate, yes a big if, then we are in for a very quiet solar cycle. We have about a decade to figure out if we are looking at one of the worst food disasters the world has ever experienced coming up with that cycle. This shows amazing correlation between temp and length. BUT the plot does not even agree with cycles shown a couple of Figs later. CERN seem to have accepted other’s reports on faith alone! Thanks a lot for that, really appreciated, that’s a pint of finest virtual ale for you my lad! Amateur radio satellites were doing such conversions decades ago. The uplink/downlink bands were different. Although they were fixed. From the design point of view that is the easiest way to design because the Tx/Rx filters don’t have to be near as sharp. Which also means things like temperature compensation can be avoided. I’m mostly a DC guy myself i.e 2 to 30 MHz. Always looked forward to sunspot peak skip. However, low spot years were better for security. Part of the romance for me was hoping the next spot cycle was even stronger. Which is why I love the Solar-Terrestrial Data on the sidebar. Nevertheless, this is an aphorism that every scientist and engineer should hang on his wall. It is also a concept that Lief would be well advised to ponder. Mr excellency moderator – I tried to do italics, but nothing showed up. Pls delete first post. I won’t do it again! to do italics here use the letter i between the less than and greater than signs. to finish italics use /i again between the less than and greater than signs. There is one element missing from Rumsfeld’s aphorism: “the things we don’t know we know”. I am referring to people making strong statements based on them not knowing what is already known. Rumsfeld’s problem was he didn’t follow his own advice. “I doubt 6 months” meant there was a lot he didn’t know he didn’t know, and apparently didn’t care to find out. Then how does high solar activity bring down power grids due to current surges? Also thanks for the info? see especially section 30, but the whole thing is worth a read. Maybe lowest since the 1810s. Not likely, IMF is now what is was in 1901-1902 and will not go lower now that SC24 has started and new solar magnetic flux is emerging. George E. Smith (18:43), like you I have thought that “seven cycles of the highest average sunspot counts of all time” must be related to those temperature charts that show (or used to show) the “average global temperature” heading north. And, like you, I love the fitness of cycles when they fit. I keep trying but I have difficulty seeing a nice, tight fit. Without the sun we would not be warm, yes, but there is so much variability in the way our oceans, atmosphere (especially the long, slow waves of each), winds, and plate tectonics/volcanic activity distribute/affect that energy, plus Earth’s travel through space with the effects of cosmic rays (Be10 evidence) on cloud cover and whatever else, that I can’t find suspots telling us enough by themselves. It seems to me that given “the remarkable, and unprecedented, never before seen period of abnormally high AVERAGE sunspot numbers” we should be basking in something like the Medieval Warm Period. I wish we were. Why aren’t we? Possibly because we are not so basking. and neither a lack of solar activity [as reflected in cosmic rays] during the Spoerer and Maunder Minima. Maybe not “never before” but certainly in the last 400 years, but we are on the downslope now and wont recover until 2130. Why Leif would prefer to look at proxy records rather than the real thing just baffles me. In regard to my graph, the simplest method is to look at the purple angular momentum peaks in the background, when they are on an upward trend so is solar activity. The only time that changes is when we have grand minima signified by the green and orange dots.